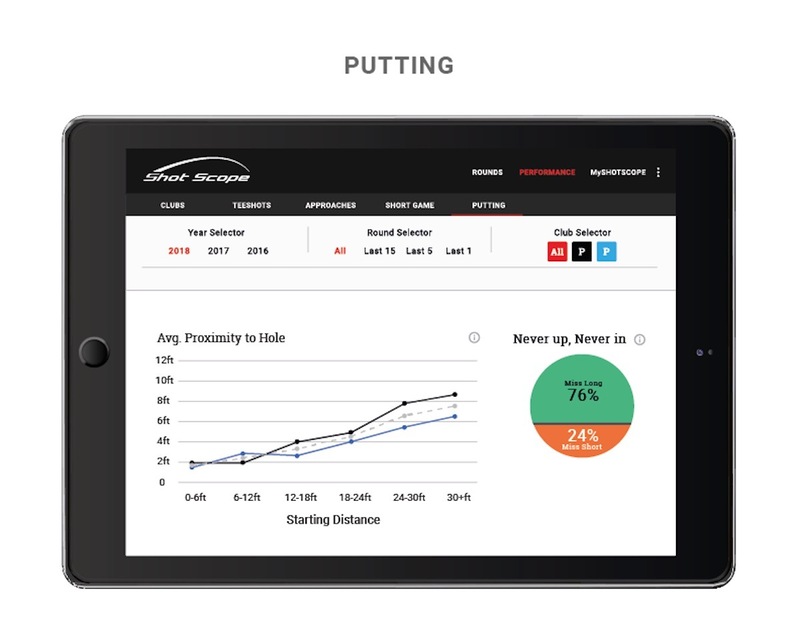 When it comes to golf data collection and shot tracking, you have two main issues to consider. 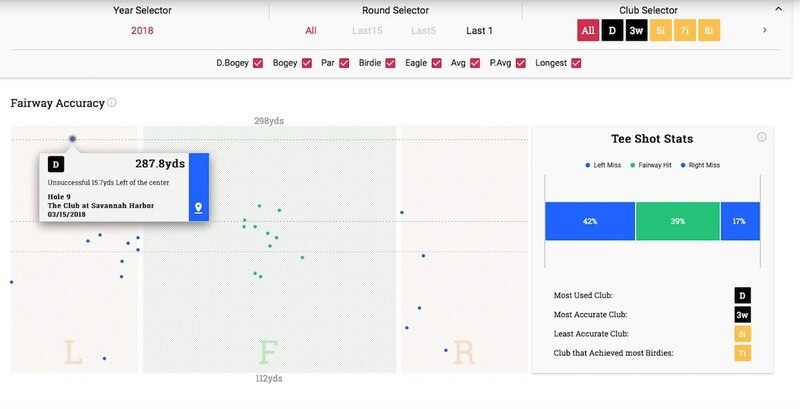 The first is how easy is it to collect the data, and the second is how easy is it to view, understand and, ultimately, use the data to improve your game. When it comes to data collection, you have wearables such as Game Golf or Sky Caddie’s LINX GT GPS watch, which require tagging, and if you forget to tag you’re basically out of luck. The phone-based Arccos doesn’t require you to tag but does require you to keep your phone in your pocket to detect shots. If all you want to do when you play golf is to simply play golf, those options may require more work than you really want to put in. When it comes to actually using the data, you have to deal with what the Silicon Valley-types call the user interface. Every system collects a ton of info during your round, but you’re still left to interpret it all and figure out how to best use that info to guide your practice. The Scottish company Shot Scope has already licked the tagging bugaboo with its automatic shot detection functionality, and this week is adding an upgraded Performance Package to its user interface. If you’re into analytics and interactive charts and graphs, read on, because there’s a decent chance you’ll find something that can help your game. 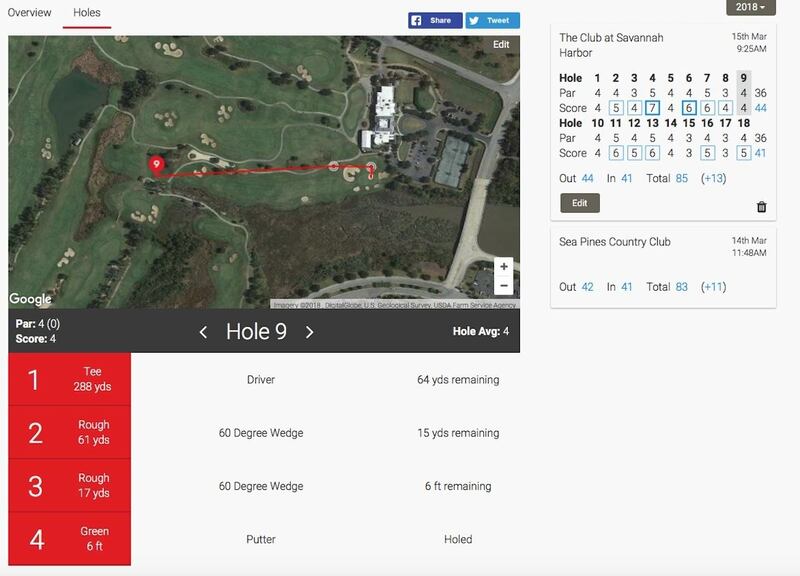 Since its release in 2016, Shot Scope’s data collection process has been an absolute no-brainer as the easiest to use on the market: all you do is play golf, and the Shot Scope unit automatically detects your shots and collects the data. There’s no tagging, and you can leave your phone in the bag. The new Shot Scope V2 combines shot detection with a GPS watch. Dear says the V2 has also added penalty stroke functionality, and you can tell it if you’re hitting a provisional. Once you hit your provisional, the watch starts a 5-minute look-for-your-ball countdown. Shot Scope’s phone app will give you a solid overview of your statistics, but the desktop dashboard gives you the meaty information. You can look not only at overall average distance, but Shot Scope gives you something called Performance Average Distance (called P. Avg. ), which removes outliers – fat shots or a shot that hits a tree, for example – giving you stats for what would be considered good shots. Also, each category has an Information button for those who need a little help understanding what they’re looking at or how to put that specific data to good use. 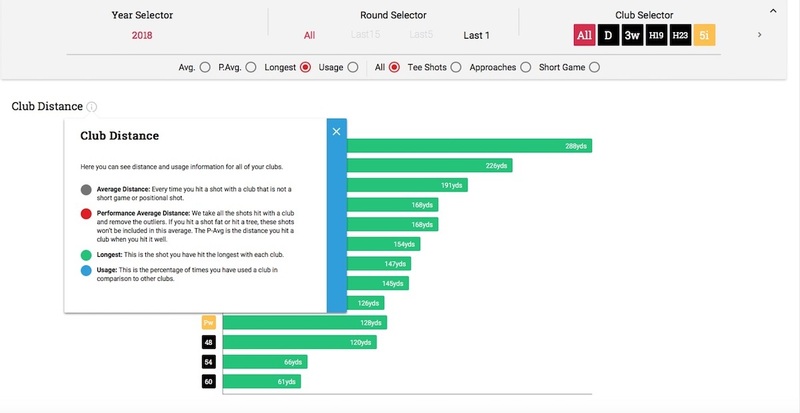 Tee Shot analysis gives you an interactive graph for your tee shots, and lets you filter your shots by score: you can include all tee shots or just the tee shots for holes you birdied or double-bogeyed. You can also filter by club used. 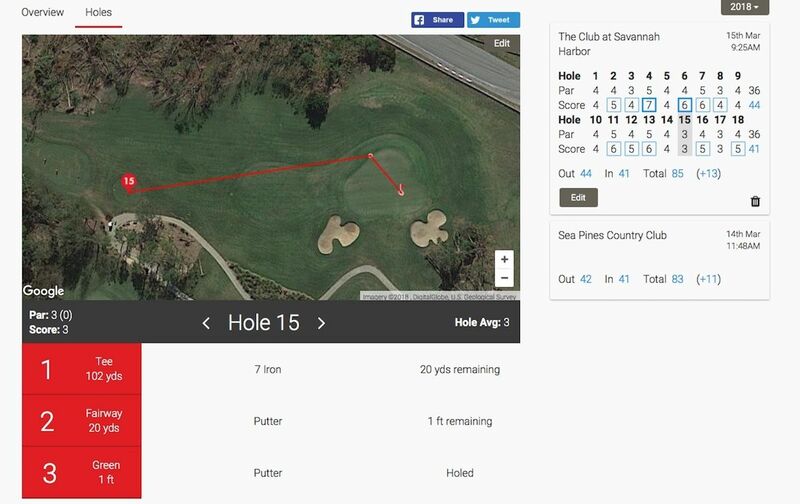 A pretty slick feature allows you to click on a particular dot that represents a specific tee shot. A box will pop up telling you the date, course and hole you on which you hit that shot, the shot distance, and how far from center the ball wound up. If you click on the little location icon in the lower left-hand corner of the box, the screen will automatically switch to show you the actual satellite view of the hole, with an overlay of your shots and a report of how you played the hole. The Approaches and Short Game sections plot all your other shots relative to the pin. Both sections break the green down into four quadrants and show where your ball landed. Green dots indicate you landed on the green; blue dots indicate you didn’t. Again, you can click on any dot and get the particulars of that shot, and another click will bring you to the satellite view of the hole. Another new feature is what Shot Scope is calling the Red Zone. For Approach Shots, it’s anything within 15 feet, and for Short Game it’s anything within 6 feet. 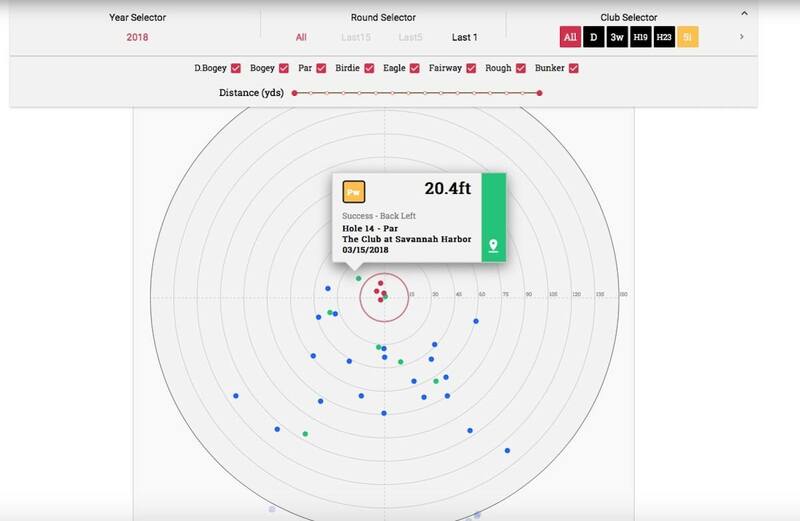 You can even drill down to find out what percentage of your shots are landing in the Red Zone, and which clubs from what distances are getting you there. What differentiates Shot Scope on the green is a feature called Pin Collect, which can – pardon the pun – pinpoint the actual hole location on the green. After you hole out, simply hold the watch over the hole and press a button indicating whether you had one, two, three or four putts. 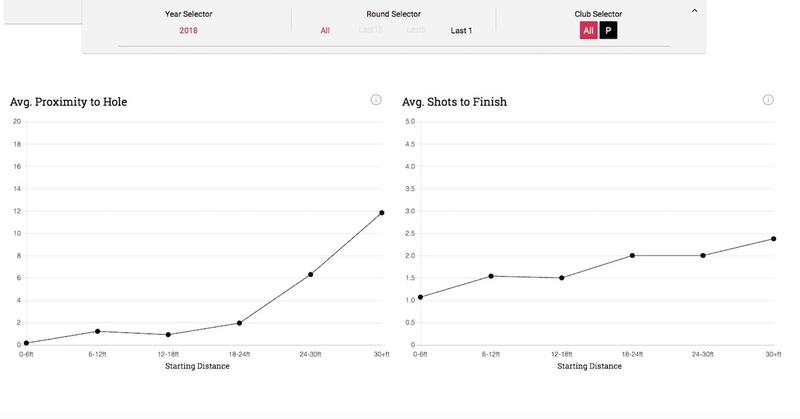 It takes no more than 5 seconds, and it lets the system know exactly where the hole is; a key detail for unlocking approach, short game and putting stats. 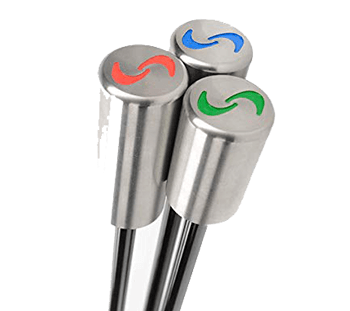 Shot Scope gives you the basic putting stats: average putts per round, average length of holed putts, longest putt holed, and how often you 3-jack. You also get a Make Percentage chart from different distances, as well as a little circle graph called Never Up, Never In. You’ll also get a chart for Average Proximity to the Hole. For example, this chart shows that on puts longer than 30 feet during two early season rounds, I couldn’t get closer than, on average, 12 feet. Not surprisingly, the Average Shots to Finish chart shows nearly 2.5 putts from that distance. Shot Scope provided the following chart, and it may be the most fascinating. You’ll notice two different colored lines surrounding a dotted line. The two lines represent putting stats with two different putters, meaning the system will allow you to keep stats for two different putters over the course of time. You can use it to let two putters battle it out and see which one performs better, or to find out if that new $400 Scotty is outperforming your old Billy Baroo, or if you only think it is because it’s pretty. 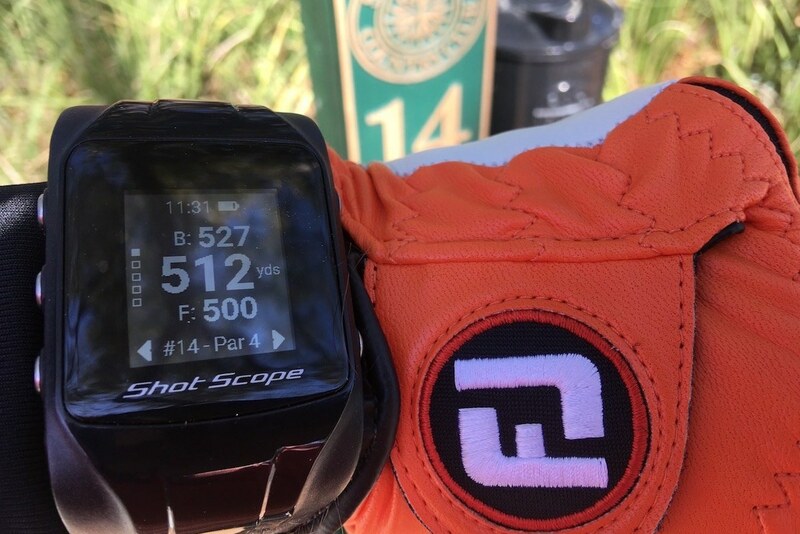 If you don’t like wearing anything on your wrist when you play, the Shot Scope GPS watch certainly isn’t going to change your mind. It’s a big watch. But if you wear a GPS watch already, you know you’ll be acclimated to it by the time you finish warming up, and it becomes a non-issue. Weight-wise it’s virtually the same as the slightly smaller Sky Caddie LINX GT. If you hate having anything on your wrist when you play but still want to collect data, Arccos is the obvious choice (provided you don’t mind keeping your phone in your pocket). If watches don’t bother you and/or you don’t want to interact with your phone during your round, data gathering doesn’t get much easier than Shot Scope. There’s no tagging. You simply play golf. When it comes to interacting and using the data, Many systems flirt with what could be called Information Overload. To be truly useful, the user experience has to be easy and the analytics to be both meaningful and understandable. Shot Scope V2 retails for $249.00, with no annual fees or subscriptions. 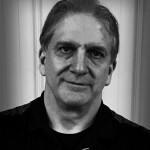 For more information, visit Shotscope.com. Very good system, have used for @ 6 rounds. Fairly accurate, takes about 5 minutes to edit a round and correct anomalies or if I forget to tag the hole location and number of putts. The GPS on the watch is excellent, sensors are very lightweight and don’t even notice them. Purchased Arccos and returned when I found out it needed phone is pocket to work. Only drawback is you can’t be as specific as I would like on hole location and final putt while editing on an iPad, you can get there, just tricky. I ordered a Shot Scope V2 based on your article. I have received it and tried it 4 times already, on 4 different courses. I experienced mapping issues every time. I don’t know who maps their courses, but I only had one round where I obtained useful information, and I had to go back in and edit/correct many of the entries. One course sent me out on the back nine and the GPS worked OK, but once I got to the front nine, it couldn’t locate. It never read correctly on my round on Sunday, so I shut it off after 2 holes. I live in MA, so I’m wondering if it’s just where I live. I have used the V1 for about a year and is overall very pleased. I have now ordered the V2 and really looking forward to put in play! Also very much looking forward to the new dashbaord, as I have had some comments on the old version. Worth mentioning is that I have had some issues with tagging the shots, some shots counted doubled and miss tagged a few on my walk to the ball, but have got the explanation that is due to my way of carrying the club in my hand while walking or cleaning my club while walking. Anyway, just a great product – and what it looks like an even greater updated version! Fairly sure GPS doesn’t require data. In any event, the review says you don’t need to keep your phone in your pocket (that’s one of the other products). 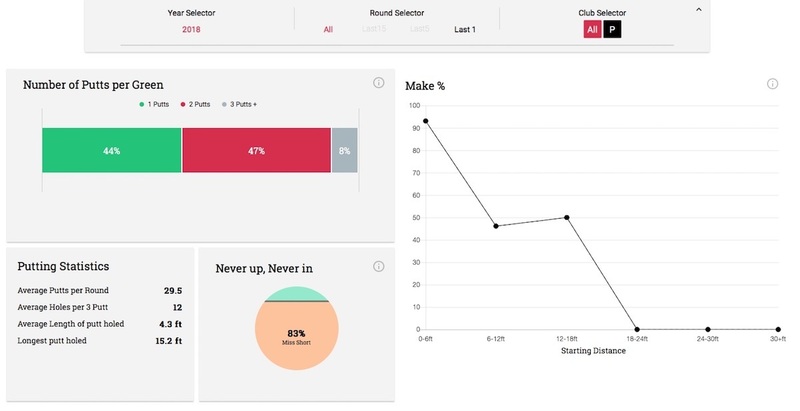 Does it provide Strokes Gained (or an equivalent) stat system for the various aspects of your game like Arccos and GameGolf do? This is pretty important as those stats tell you more than individual old-school stats. how does it distinguish number of putts if you take additional putts after you holed out and how does it know practice swings from regular? Potentially a great GPS watch in the future. Current features make it a wait and see for me. Does not have any time and date functionality as a regular watch off of the course. Battery life very unimpressive. Other minor issues “being worked on”. I’ve been using the original GameGolf and very happy with it. I don’t quite get people complaining about tagging shots, since it’s such a simple gesture that’s just part of my pre-shot routine. That said, if I didn’t have a Garmin S60 GPS watch already I’d consider this combo. Agreed. I have the original Game Golf, and tagging isn’t an issue for me as well. It only drains the battery of the device and that is it. If I wanted to go with tagless, Shot Scope is ideal, since it is an independent device away from the phone. I really liked the data from the Accro is great but I didn’t like the counter weighting. Apart from my Arccos system not consistently picking up my shots, the tags would mess with my head as they made it look like I was choking down on each club. Great review. Piqued my interest in the product. One question I only see tangentially addressed. Is there a performance difference between driving and walking? I have hit the age and physical issues which preclude walking the course for more than a few holes. To play 9, 18 or other number of holes, I need to ride. (That’s why Bandon Dunes is not on my bucket list). There’s really no functional difference between walking and riding with any of these products It only cares about where you hit your shot from and where it lands. How you get from Point A to Point B is immaterial. I just bought mine two days ago! Waiting for your new toys is always the hardest part! It does need to be on your wrist – the proximity of the watch and the screw-in sensor in the grip is what makes shot detection work. It’s a big watch, and if you don’t like wearing a watch when you play, this won’t make you feel any better about it. As mentioned in the article, watches don’t bug me while playing (I don’t even take off my wedding ring! ), so it didn’t take very long to acclimate to the Shot Scope. It’s all up to whether you can have something on your wrist. I’ve been interested in this product since reading about it on MGS last fall. I really appreciate the review of their updated software. Will buying through links on this page help support MGS? I noticed one link goes to Amazon while the other goes to the Shot Scope website. Not sure if it makes a difference to MGS which one is used. question: is use of this technology legal under usga for local events? if not the technology can you keep the ‘buttons’ in the bottom of the grip? i recall ben crane getting dinged for having dots on his clubface used to track face data on a simulator. i’d assume this falls into the same type of category? It has 3 operating modes – you can use it as a GPS only, as a data collector only, or as a combined GPS/data collector. Does V2 give club recommendations? I like that feature with Golf Pad GPS. Doesn’t at this time – it may be considered in the future. It looks like Arccos (which is on its way to me) and Shot Scope are really raising the bar for providing *information* (not just data) to their users. I wonder how the cheaper solutions will respond. I just typed a long comment with information and praise for this item as I’ve recently started using it and when I hit submit it disappeared. I recently started using a V2 and other than the fact I can’t remember to add my putts/mark the hole (totally my fault), I’m really impressed. Perhaps the best complement I can give though is to the company itself. If you have questions, need a course edited, etc., they are very quick to reply to emails and answer your questions, or try to fix whatever problem a course may have. For instance, one of the courses I play a lot changed a par 4 to a par 3 and flipped their nines. Only took a couple of days to get it fixed in their system. I am still having the problem that even though it’s fixed on the watch, it’s still wrong when you view a round in your dashboard and that throws the strokes off since the holes are in the order you actually played them but they are working on that as well. I haven’t had a chance to check out all the new dashboard stats, graphs, etc. yet but if it’s on par with their customer service then it should be great. Great article – I used to use Arccos but gave up on it mostly due to false-strokes accrued particularly when using a caddy or walking, on top of consistently poor performance on courses with poor cell service. I’m curious if / how this tech solves for that issue, because at face value the idea of combining a GPS watch and shot tracking in one device is super compelling. Cell service isn’t an issue, since you don’t need your phone. In my experience I can’t recall any false strokes. I have had extra strokes when I’ve dropped another ball for fun, but those can be edited out easily in the dashboard post round. Very helpful, thank you – just curious what the breakdown is in your usage between driving and walking? I see they have a 30 day money-back gtee, so even if it turns out to be an issue I’m not worried about it, just more curious. Thanks much! I’ve only used the V2 twice, both times riding at resort courses. I’ve used the older version – the one without GPS – many times while walking. Accuracy is fine with both, although Shot Scope says they GPS module in the V2 has improved accuracy. I have around 20 rouns on my Shotscope V2 since it arrived in January. Most are for my home course where i walk but a few are from Portugal where i used a buggy. All are completely accurate and I’m a huge fan of this little gadget. Prior to this weeks update I felt that this was the single best piece of golf kit I’d ever purchased. Can’t wait for tomorrow’s medal when I’ll know the yardages to and over the ponds and bunkers!